There are literally thousands of styles of Chi Kung (Qigong) in China. Some are famous and involved. Some are obscure and quite simple. There is also a lot of misinformation on the topic. For instance the term "Ch'i Kung" or Ch'i Exercise, was rarely if ever used before 1950. Ch'i Kung is, in some sense, a newly created designation compiled from older sources. Like the ubiquitous "Medical Chi K'ung" it is a term with little meaning more meant to capture attention and a market than anything else. Formerly, Ch'i Kung, which was more commonly known as "Nei Kung" was divided into three classical forms based on its use and origin: Scholarly, Martial and Religious. Each had attributes and characteristics and any could be used for health. The idea that you did this exercise for that illness was not often utilized and was far more personalized and sophisticated than much of what we see today. Nonetheless, this is a great study and should be scrutinized with care and intelligence. This is why we have so few book listed considering the immense popularity of the subject. As in the case of Feng Shui books, few are good enough to waste time with. Click picture to see if there is a larger version. Chinese Health and Martial Texts! Chen Tuan is a well known but mysterious figure in the Tao universe. His name and writings are scattered throughout the Taoist cannon, burdened by more texts than ay other belief system in history. Ton Bisio has thereby rendered a service to both the blurry-eyed scholar and practicing martial devotee by compiling between two covers a large portion of Chen’s Tuan’s life, teachings and ideas. There’s a lot here so, if you are new to the study, just take smaller steps such as those Tuan has set out for us. A varied collection of key concepts that might be a little thick for the new student; a lot of vocabulary all in the same place. "The Authentic Classic of Nei Gong is an obscure text of unknown origin yet it stands alone as the definitive text on internal energy and the generation of internal power. Hand copied and passed from teacher to student, it is one of the "secret transmissions" of Chinese martial arts. 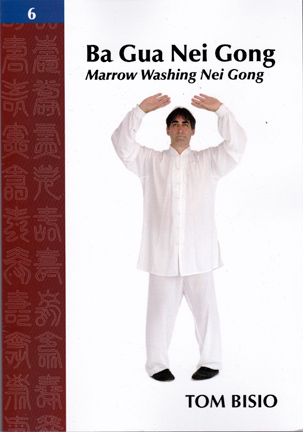 The Authentic Classic of Nei Gong is a practical manual on internal energy development and its fundamental importance in the martial arts and fa jin. 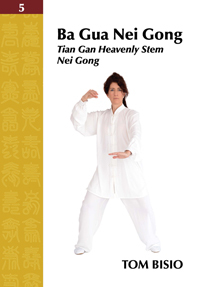 Divided into four parts the text takes the reader step by step through the details of Nei Gong Practice and in the final section, its application to self-defense. These four sections are: 1. Nei Gong Jing (Internal Energy Classic)), 2. Di Long Jing (Earth Dragon Classic), 3. Shen Yun Jing (Transported Spirit Classic), 4. Di Long Jing (Earth Dragon Classic).... this text is accompanied by extensive footnotes and diagrams that clarify the more obscure passages which otherwise pre-suppose a knowledge of Daoist tests and imagery from the I-Ching. The appendices further explicate the relationship of the Authentic Classic of Nei Gong to the internal martial arts Xing Yi Quan." As a later addition to the world of Chinese martial arts, Bagua is the inheritor of many branches of information. In addition to its signature circling and twisting, it is also a system comprising much Kung Fu information that is commonly scattered and hard to find. Patting the body certain ways can be beneficial to developing Qi flow. The method here is simply described with easy instructions and clear definitions of Patting (yin) and Slapping (Yang) methods. 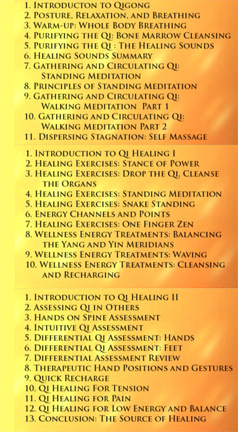 This is followed by a section on Guiding Qi (Dao Yin) showing some key actions of Nei Gong training. The concentration in this text is on standing practice with the arms lowered (WuJi style) or raised in front of the chest (embracing method). After these two universal exercises comes a section of six more patterns developing a sense of the proper directional movements and their effects on the body. A clear and concise introduction to general Nei Gong practice and some very simple ways to find results. 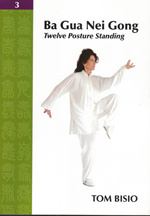 In this text, standing postures (12) become much more Bagua oriented with 12 animal shapes, each with a specific Bagua version of a classical posture. The first of these is finally demonstrated as a Single Change Palm, the basic method of reversing the circle in Bagua. This series is particularly good at listing those Key Points in each posture and movement. Also, the methods shown in all books to this point can be trained in any order, allowing customization for the student. 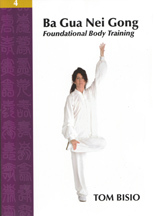 This fourth volume covers 25 fundamental exercises and Bagua Walking Nei Gong. For those who want to know what Bagua is, JiBen Gong or fundamental exercises are important because they introduce the flavor of the system while opening up the pathways in the correct ways. Many of these basics training forms encourage waist and shoulder rotation while giving good examples of the proper method. . This series is particularly good at listing those Key Points in each posture and movement. Also, the methods shown in all books to this point can be trained in any order, allowing customizing for the student. "Tian Gan Nei Gong is indispensible to the pracice of Ba Gua Zhang and the martial arts in general. The Tian Gan Exercises develop the ability of the legs and waist to generate the torsional power known as 'Silk Reeling' Energy. Tian Gan also trains the correct internal mechnaics" .... ' Tian Gan literally means' Heavenly Stem.' The name... refers to the longitudinal axis or stem that passes through the body.... combined with the movements of the arms and legs, stimulate and open the meridians...."
In this volume Tom Bisio takes a decided step toward the core of the the practice—literally. Almost the first thing he does in this volume is to introduce bone breathing, an ancient and perennial method well known among martial artists and monks. He extends this into a series of even deeper direction aiming at concentrated focus on the marrow in the bones, partly a method of concentration that engages fundamental reactions. He then shows a consolidating series of postures and massage techniques. Finally there is a chapter on principles linking the exercise to its philosophical basis and relation to the I Ching: the Classic of Changes. This series is particularly good at listing those Key Points in each posture and movement. Also, the methods shown in all books to this point can be trained in any order, allowing customizing for the student. Originally published as the first significant text on this subject in the English language. Terry Dunn, the creator of the most popular Tai Chi video of all time, explains a number of patterns with the Tai Chi ruler, a small carved instrument for Qigong practice. This is a very good introduction to a subject which, if you get into it, has surprising depth. For instance the history of the ruler traces its origin back to Chen Hsi Yi the legendary Taoist creator of Liu He Ba Fa and a good friend of the first emperor of the Song dynasty and the legendary creator of Tai Tzu boxing. Small world, isn’t it? 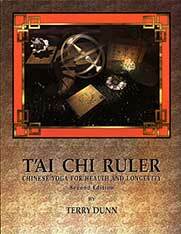 The Ruler has some very useful aspect for Qigong training. For instance, if the practitioner wants an instrument but does not want to carry around a weapon the Ruler is perfect. By definition it coordinates the two hands. It also contains a rather profound self defense method but that’s another story. NOTE: The Tai Chi Ruler refers to the "Great Extremes" of Yin and Yang, not the style known as Tai Chi Chuan or Grand Extreme Boxing. Nonetheless you may also find it in that section due to its name. Second Note: This is a revised edition of the earlier book and has a new cover. And more: The VHS companion of this book is in the process of conversion to a DVD. Ask us the status of this when you order. Here is the companion DVD to this text. Often referred to as "Taoist Yoga," this is a fine text on the art of Chi Kung. One of the first ever written and widely available in the English language. Still a classic it contains not only some instruction but, more importantly, a properly respectful attitude that this (Chi Kung) is something more than a New Age exercise for the Spa of the Future. It would be an understatement to say this is a classic. KGD sets out the structure and meaning of the Hara ( in Chinese, the Dan Tian) as not only a spiritual center but a ego-preserving practice, a transcendental aspiration and an esthetic pivot point. He shows the relation of breathing. posture, and other "outward" aspects of life to the deeper, and very vital aspects of what it means to be human. 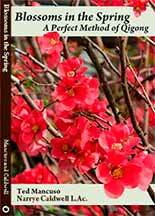 This book was one of the first to introduce the Western world to those life-affirming aspects of Zen and cultural wisdom extending from the roots to the blossoms of Japanese culture. Dürckheim has had a profound influence not only on meditators and seekers but on humanistic psychology as well. Of all of his books this one is best known and widely appreciated. This book presents three classic texts on the nature of the Tao. It examine the macrocosm of the universe related to the microcosm of the human body. We see this reflected in the three levels of Taoist teachings, the Inner, the Outer and the Secret (Xuan). The Outer level deals with Human life in its social and familial setting. The Inner level deals with the energetics of the individual practitioner. The secret level discusses transformations which bring ineffable and unpredictable aspects of cultivation. This is not a critical account of Taoism but a discussion from the standpoint of classical students. It records rituals and aspects or authentic Taoist ritual which might be confusing and a little mysterious to some but that's Taoism at the cultural level. 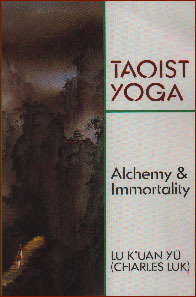 A very good, slim volume on ancient Taoist practices and beliefs. When I first stumbled on this text, I was unaware of Yi Quan. Therefore my reaction to the book was without concern for its martial origins and applications. I was taken with the commentson its relation to my own first Taiji style, Yang Shi, and the use of the WuJiShi practice by my Great-Grandteacher, Yang Chen Fu.Cai supports this by claiming the WuJiShi was passed down from Yang to Ye De Mi then Jin Ren Lin and then to himself. Cai is responsible for bringing this method to the South and the Guangzhou area. Though quite technical in parts, this is a small gem of inspirational teaching: solid, foundational Qigong in a world suddenly hustling faddish and questionable techniques. Whether you subscribe to the Yi Quan general theory or not, this is a fine source of information. This book contains hundreds of authentic herbal formulae for external injuries. It was compiled by De Chan (from whom, by the by, we personally learned the Shaolin Ba Duan Jin years ago). These records from the Shaolin Temple itself cover such martially specific injuries as prescriptions for injuries such as "Neck Hit by Halberd" and "Injury to Bone Due to Poisonous Arrow". Plasters are also given. This book shows real formulae and therefore not necessarily composed of easily obtained herbs. Prescriptions are in Pinyin and Latin. Topics include Medicinal Wines, Dim Mak injuries, Fall and Strike injuries and more. No illustrations. We believe that Mr. Dong believes. We also think that if you are really interested in the subject this is a book you should read. For those who are already convinced, Dong will be speaking their language. To those who may believe that here is a real subject for real exploration, Dong will probably seem to have already capitulated too easily. Skepticism and cynicism are often differentiated by the slightest shade of coloring. There is much in the realm of Chi Gong which we have seen with our own eyes and felt with a thorough conviction. There is also a plentitude of silliness and quackery. All in all the subject itself bears scrutiny and, we think, rewards time spent. Chi Gong has a solid grounding, for instance, in martial practice. It's how far you can go with it that's the sticking point. Besides being a student of Feng Zhi Qiang, Mr. Wang is also his son-in-law. 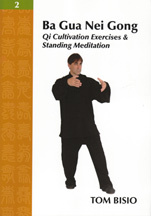 His access to top level information about the art of Qigong shows throughout this text. You will note PLUM does not have a large collection of Qigong books. This is because so many of the dozens we review are mediocre approaching terrible. This is not the case here. But be aware, this is translated from the Chinese. The relatively good use of English occasionally lapses despite the quality of the explanations. This book is divided in eight sections. It follows the typical Chinese approach to knowledge where definitions are paramount so much of this book is dedicated to supplying definitions. This can be deceptive because the definitions are actually crucial to an understanding of real Qigong. So "tranquility" for instance is seen as a combination of multiple factors and learning these factors makes "tranquility" more than a word. 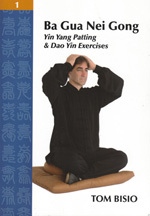 This book is most appropriate to the Qigong practitioner, martial artist or Chinese style doctor. Sections divide into explanation, exercises and a Q & A section. Most books on this subject fall into two categories: useless because it's just "passed down" information or too airy. This is solid, technical and informative but will bear your concentration. Feng Zhi Qiang was, by the way, not only a top martial artist and Qigong expert but the student of Hu YaoZhen, basically the father of modern Qigong. 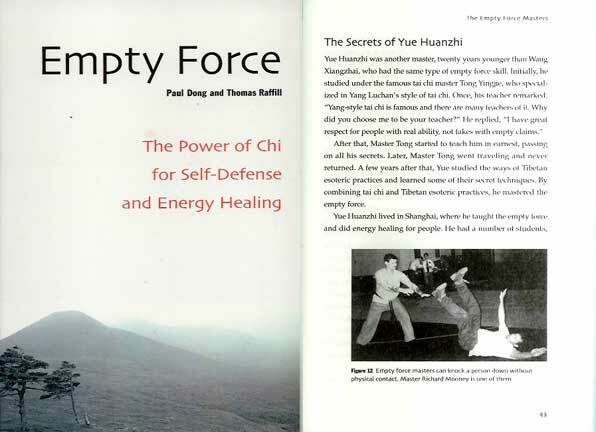 "Empty Force, or Ling Kong Jing, is an extraordinary technique that harnesses the power of chi (the body's vital energy), enabling masters of the art to defend themselves against opponents and heal themselves and others without physical contact. Through the practice of this method, one gains mastery of the mind and spirit and gives rise to a physical force that can affect others—a powerful manifestation of the achievement of harmony with nature. " 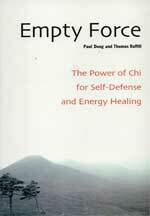 There is little doubt that Empty Force is the most controversial of topics from the area of Kung Fu and Chi Kung. This is a reissue of one of the first books written in English on the subject. Gin Foon Mark has been around for a long time. A master of Southern Mantis, a student in temples since his childhood, an inheritor of a fine martial lineage: he is well chosen to write a book like this. This is a significant text because the Six Healing sounds are famous and well documented in Chinese history. 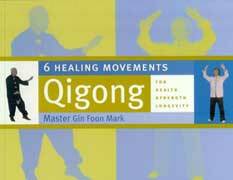 In this case we have the benefit of Mark having studied directly from Ma Lai Tong, the developer of this version of the sound Qigong and a famous Qigong expert. This book covers many topics such as tongue position, basic postures, exercises for separate organs, circulating qi on the microcosmic orbit and more. Thin but packed with information. If, by chance, you actually want to sound like you know anything about the subject of Qigong, you should immediately go out and buy this book. Kenneth S. Cohen is a scholar, and from personal experience, a gentleman. He has also written what must be a source book for every practitioner. He calls this "The Art and Science of Chinese Energy Healing" and he's afraid of neither. He has garnered a ton of scientific work while clearly and patiently explaining the essence of Qigong. Do we agree with everything? Two martial artists, three opinions as they say. But for integrity, honesty, thoughtfulness and just plain work, this jumps to the list of essential volumes. You think we're positive about this book? Wait till you read the review. Buy the book and buy it at full price and support someone who is actually doing some significant work in the field. This little pamphlet was one of the first books every translated into the English language. Interestingly enough such practices as Qigong were almost exclusively recognized first by the martial arts community. It sets down in simple terms, often question and answer, the basics of Chi Kung. Finally, there is a special section on the treatment of nocturnal emissions. Small pamphlet, no illustrations. This is probably the 1975 edition. Limited supply. This book is a FULL COLOR rendition of the famous 8 pieces of brocade. The pictures are very clear and the instruction is side-by-side showing the standing version of this exec rise. This first edition came out in 1995 and this is the first time we've seen it. Not that common. The format is a slick paged full color production with some front notes and then the formal explanation of each of the eight sections. Almost a posture from its size and clarity. This is a manuscript from the private collection of the famous Kung Fu teacher, Leung Ting. This book's title is "The Secret Manuscripts of the Great Five Buddhist Chi Kung". This book is illustrated with quaint old line drawings. The English and Chinese sit side by side with the Chinese hand written. This manuscript was first brought to the public in 1921. Songs or poems with valuable Chi Kung information are also translated. Some very interesting observations on the nature of Chi Kung are added in the front piece. 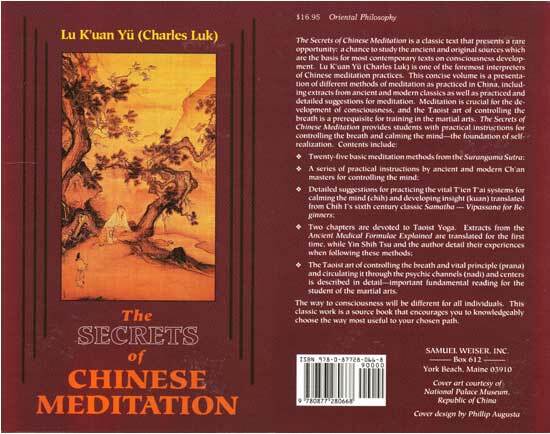 A good historical collectible for anyone's Chi Kung library. Gives you the feel of how this information has been transmitted for hundreds of years.